What goes with any wine? The dishes the pros recommend tend to offer some combination of salty, crunchy and rich. 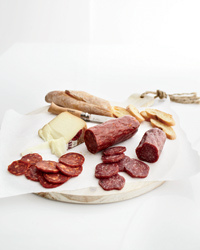 According to Todd Thrasher of Restaurant Eve in Alexandria, VA, "Charcuterie is a rustic food that has the ability to pair well with any wine." "Humble foods make wine shine," says Michael Madrigale of NYC's Bar Boulud. Try Point Reyes Farmstead's Toma. $18 for 1 lb; point pointreyescheese.com. 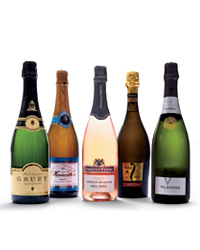 "It will even play with Champagne," says Amy Currens of San Francisco's Prospect. Urban Accents sells a new indigo variety. $7 for 16 oz; urbanaccents.com.